Only an hour-drive from Vientiane, the small and peaceful village of Ban Na on the outside of Phou Khao Khouay offers guided trekking and a great opportunity to watch wild elephants from the safety of an observation tower. Finding numerous tracks and possibly getting a glimpse of these wonderful creatures will be an unforgettable experience! In the mid nineties, a considerable part of Ban Na's land has become ‘home' of an elephant herd of more than 40 heads, victimizing the local farmers by frequently raiding their fields. The shifting of the elephant's territory from the upper hills to the lowland has probably been caused by the planting of sugarcane or disturbances due to the construction of a reservoir for power generation several kilometres to the north. It became difficult for the farmers to plant new crops for which they originally hoped to earn their living. Even after giving up planting sugarcane, the elephants do not show any signs of returning into the mountains, but continue staying in the extensive bamboo belt between the village and the park. Therefore, they are posing a permanent threat, physically and financially, to the people. The elephants also destroy a large part of the bamboo while bulldozing through the vegetation, thus having a possible future impact on the village handicraft (rice basket weaving) as well. Nowadays, community-based tourism is introduced to provide the villagers with a new source of income. 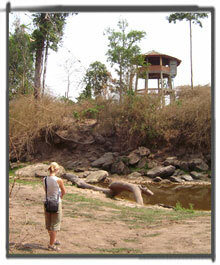 In April 2005, Ban Na opened an observation tower in the forest. From up here it is possible to observe wild elephants (yes, wild elephants!) from a close distance at a saltlick and while they bathe in the nearby stream. Elephants usually have to go to such ‘saltlicks' to get essential minerals, which are lacking or in low concentration in their staple food, by taking in some soil. With a bit of luck, you can watch elephants visiting the area around the tower, usually in the evening hours. No guarantee, though, can be given to see the animals! They're wild animals with their ‘own schedule and free will’. Other animals, such as deer, wild pigs and wild dogs might also be seen or heard at the saltlick. In the early morning hours you are woken up hearing nothing but the sound of countless birds around you. Occasionally more than fifteen elephants (some visitors clain forty-according to the guestion) have been seen at the site at one time, but often they come in a group of five or so. A huge tusker (male with ivory tusks) is in the family and several very young ones as well. According to many visitors up there, it's a rewarding ‘experience of a lifetime, just fantastic’. With you being seven meters above ground, the elephants may even be directly beneath you under the tower. 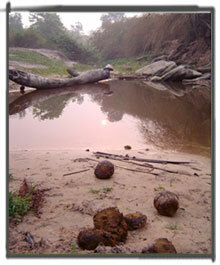 Many traces of elephants, such as tracks, dung and destroyed vegetation, can be seen in the area, too. All this so close to Vientiane! Because you're in the midst of the elephant territory, it is very important to observe rules for your own safety. To minimize the possibility of an accident, the number of visitors is restricted and the instructions of the guides have to be followed strictly at any time. Thus, no self-guided tours are allowed. The most important guidelines are handed out to you for reading before you leave the village for the tower. Since the elephants usually visit the river in the early hours of the night, one cannot walk back to the village in the dark. No one knows whether a lone bull is waiting for you somewhere…! We urgently call on you not to take any risks! Please do not feed the elephants. This may have unwanted consequences for your safety or for future visitors, since giving food to the animals will most certainly change their behaviour. Please do not forget, wild elephants are no pets. Let us preserve them in the most natural way possible! Don't miss the great and thrilling experience on the elephant observation tower! The village of Ban Na exists since 1948. 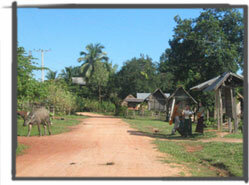 It is a quiet, typically Lao rural village. It has 600 inhabitants or 110 families, tendency slowly increasing. This friendly village is a good place to learn more about the genuine lifestyle of the Lao Loum people. Most of the villagers are subsistence farmers (rice and vegetables like eggplants). The women go daily into the forest to collect some additional food from there. Men may go for hunting, even into the nearby-protected area, or for fishing in the numerous creeks during the rainy season. After work, children play a game of football or takraw, a combination of volleyball and football, in the playfield. Most of the villagers are subsistence farmers (rice and vegetables like eggplants). The women go daily into the forest to collect some additional food from there. Men may go for hunting, even into the nearby-protected area, or for fishing in the numerous creeks during the rainy season. After work, children play a game of football or ‘takraw’, a combination of volleyball and football, in the playfield. In the evening, villagers meet in each other’s houses to sing and play the guitar, drink a Lao Lao (locally brewed rice whisky) and eat sticky rice with fish or soup. You can also visit the local ‘pub’ for a refreshing soda. During the months of December and January it can be quite cold and in the early morning hours the people are gathering around smoky fires along the village road with a hot meal or drink in their hands to warm up after a chilly night. Almost all women and young girls of the village are engaged in basket production. With astonishing skill and speed they split and weave the raw bamboo into neat small baskets. To provide the villagers with some income, these commonly used baskets for sticky rice are finally sold in the region, Vientiane or even Thailand. A Lao company producing high-end handicraft by using natural materials and dyes has committed itself to teach 50 young people of Ban Na until the end of 2007 the technique of weaving baskets, bags and other items in best quality for export to Japan and Europe. The company is supported by the German Development Service (DED) in a joint venture called Public-Private- Partnership, in which the local partner gets financial incentives from DED when following a good practice agreement to the benefit of the people and the environment. A walk through the village will give you first hand opportunity to observe the whole process of basket weaving, from cutting the raw material to the finished product ready for sale. 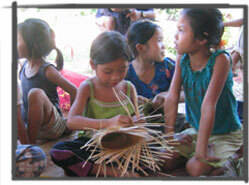 If you are interested, the villagers might even teach you how to weave a rice basket yourself! Ideally, you just stay a day or two longer in Ban Na. Before you leave, you may purchase a traditional sticky rice basket from one of the families for a reasonable price as token. Ban Na has more to offer than ‘just’ elephants. Longer treks to more distant places are rewarding, such as Nam Hi or Tad Lung waterfall, or the more distant Tad Fa, a 40-meter high cliff. This might of this waterfall is unfortunately only seasonal. In the future more trekking opportunities will be explored. On the way to Tad Lung, the Dan Khoan plateau reveals wonderful views over the Mekong into neighbouring Thailand. 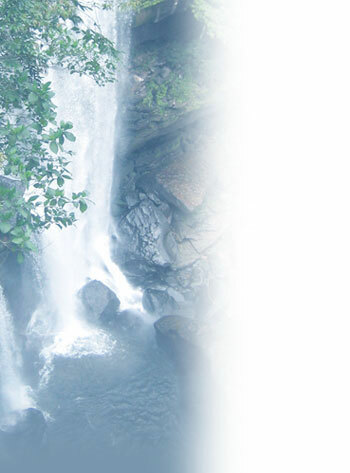 The Nam Hi River, with its beautiful forest and many birds, is a wonderful place for a trek and adventurous overnight stay in nature at its finest. During the dry season, 2-to-3-day trekking can also be organized from Ban Na to Tad Leuk. It is worthwhile paying a visit to the nearby Wat Phabath, one of the more important pilgrim sites of Laos because of its well-known Buddha footprint. It is located at National Road No. 13, directly on the way to Ban Na, which is on 1.5 kilometres away. The footprint (phra bat) of the right foot of Buddha lies behind the stupa and points at the nearby Mekong River. Every year in July (with full moon) the temple celebrates a major festival in honour of Buddha. The serene Wat Phonsane (2 kilometres away from National Road No. 13, turn right at Ban Phabath) lies on a small hill. It is said that Buddha, before leaving his footprint at Wat Phabath, came here to rest. When you climb the seventy steps, you have a superb view overlooking the majestic Mekong River. Every year in October (at full moon) people come from all over Laos to watch the mysterious Naga Fireballs. You can see these pink fireballs coming up from the Mekong at the nearby Pak Ngum. The legend tells about the powerful Naga-king rising up from the depth of the Mekong, blowing fireballs out into the air in honour of Buddha. As a sensitive wildlife area, we recommend you to visit Ban Na only in an organized group booking pre-arranged tours from a licensed tour company, which will be responsible for the trip including transportation, provision of guides and collection of the fees. Here you will also receive your ‘trekking permit. For those who nevertheless want to go on their own, public transportation is available from the southern bus station in Vientiane Ban Phakhan Km 8. Most of the buses are passing Phabath (at the temple) and you have to disembark here. Don’t take a VIP-bus, though, they may not stop. From the highway you have to walk to the village for about 1.5 kilometres. However, the most comfortable way is to hire a vehicle with driver, which can be provided by various tour operators in Vientiane. In Ban Na you can stay with a home-stay family in one of the typical village houses. Here you can experience the hospitality and friendliness of the villagers. You will stay in a traditional wooden pillar house and participate in local family life. The home-stay in Ban Na are basic, but clean and are equipped with mattresses, pillows, mosquito nets, bed linen, French toilets and ’village showers’. 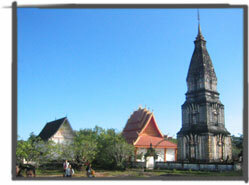 Pre-arranged tours can be booked through various tour operators in Vientiane. If you consider going for an overnight trip by yourself, we advice you to inform the villagers of Ban Na in advance. Call Mr. Bounthanom under 020 220 82 86. This way they will be prepared for your arrival.